And shot -- exultant on! 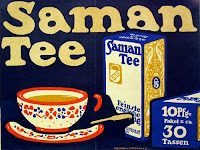 Tea began as a medi- cine and grew into a beverage. 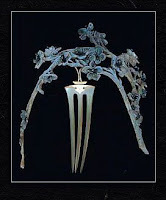 In China, in the eighth century, it entered the realm of poetry as one of the polite amusements. 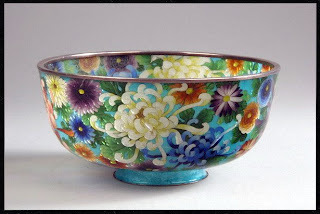 The fifteenth century saw Japan ennoble it into a religion of aestheticism — Teaism. 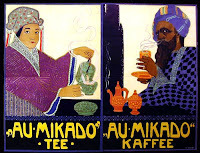 Teaism is a cult founded on the adoration of the beautiful among the sordid facts of everyday existence. It inculcates purity and harmony, the mystery of mutual charity, the romanticism of the social order. It is essentiallya worship of the Imperfect, as it is a tender attempt to accomplish something possible in this impossible thing we know as life. thus begins 'the book of tea,' written by Kakuzo Okakura in 1906. known to many as a scholar, particularly when it came to japanese art, it is perhaps not surprising that he wound up in boston. as okakura was also a scholar of english, his life took some very interesting turns in the early years of the explorartion of japan by americans (usually from boston! 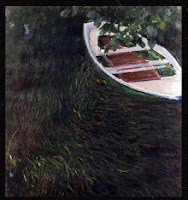 ): "Kakuzo Okakura, the connoisseur, curator and cultural historian mentored by Ernest Fenollosa, the Tokyo philosophy professor instrumental in shaping Japanese fine arts policy, mentors in turn John La Farge, the painter most responsible for bringing Japanese aesthetic ideas and methods to American art. La Farge makes a pivotal trip to Japan in the company of Henry Adams, whose lifelong friend John Hay was later responsible for negotiating an end to the Russo-Japanese War. Fenollosa's own obsession with Japan had been inspired by Edward Sylvester Morse, a principal Western figure at Tokyo Imperial University, who in 1881 delivered a seminal set of lectures in Boston on Japanese folkways. 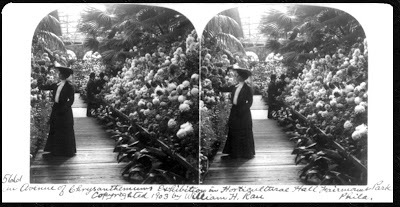 Also fired by Morse's lectures were Isabella Stewart Gardner, who founded a museum of her own, and the astronomer Percival Lowell. 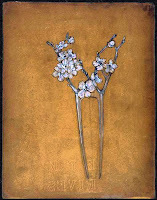 Gardner became Okakura's intimate friend and probable lover during his years as curator of the Japanese collection at the Museum of Fine Arts. 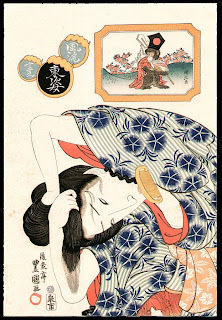 Lowell's writings on Japan became a major source for his sister Amy's Japanese-inflected poetry. Amy Lowell and Ezra Pound, who disputed control of the Imagist movement in poetry, met in Paris in 1913, the same year that Mary Fenollosa, Ernest's wife, altered the course of Pound's career -- and of 20th-century poetry -- by giving him the notes her late husband had made while studying Chinese poetry with Kakuzo Okakura." The story of Okakura, who emerges as something like the book's hero, embodies still other ideas. 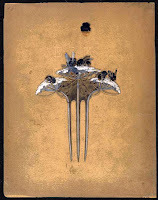 Having had a thorough education in both the new Western learning and the traditions of old Japan, he became his country's leading cultural ambassador -- but not before La Farge had taught him how to ''be Japanese'' for American audiences, how to suggest, through a certain sad charm, the wisdom of the East. Issa describes the devotion to chrysanthemums -- raising and admiring them -- as a Buddhist sect, whose "founder" (kaizan) is none other than the great haiku poet, Matsuo Bashô. 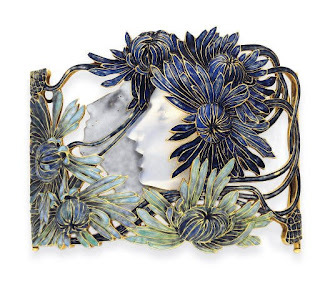 Back to the white chrysan- themums. 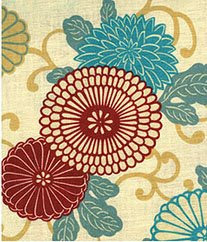 leave me the incomparable chrysanthemums! Yet hear no noise of passing carts and horses. You would like to know how it is done? With the mind detached, one's place becomes remote. And flocks of flying birds return together. I would like to tell, but lack the words. Then gaze long at the distant-summer hills. sees that it must be so. holding a cup of wine. what can we hope to do? But when I start to tell it, I cannot find the words. to get on in the world! to make my hair sleek!" 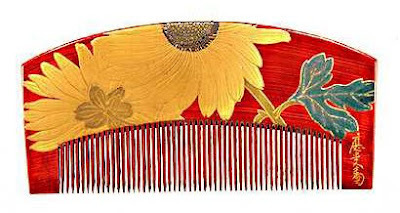 "I've bought you a comb. it gets tangled in your sandals." today's post was inspired by a very inspiring blog i happened across yesterday, leafed through from "cover to cover," and then went off doing research all day (when i wasn't photographing dragonflies). it's comprehensive, it's fascinating, and it's here. 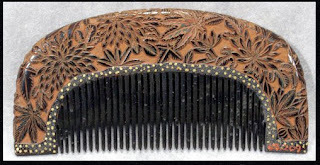 A Jap- an- ese comb is about much more than just styling hair. 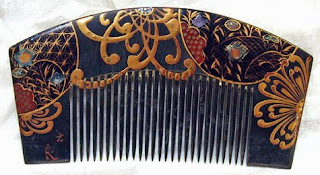 Four hundred years ago, Japan took the simple comb and transformed it into an elegant beauty accessory that became a work of art. 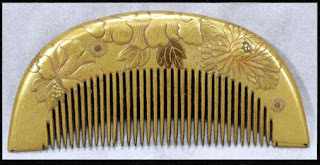 Japanese kushi (combs) and kanzashi (hairpins) became expressions of a woman's character, social class, religion, and even what neighbourhood she lived in. They also revealed whether she was married or not, her age, and whether she had any children. 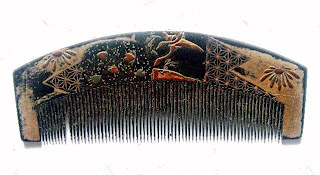 According to an ancient Japanese proverb, �'A woman�'s hair is her life,' (Kami wa onna no inochi) and from the early 1600�s until the beginning of the modern era, decorative combs and hairpins have been an important part of Japanese fashion.